Mueller Report And Barr Letter Means Impeachment Less Likely Attorney General William Barr's letter to Congress about the Mueller Russia probe is a big short-term win for the president, but it doesn't "exonerate" him totally, and Democrats want to see more. 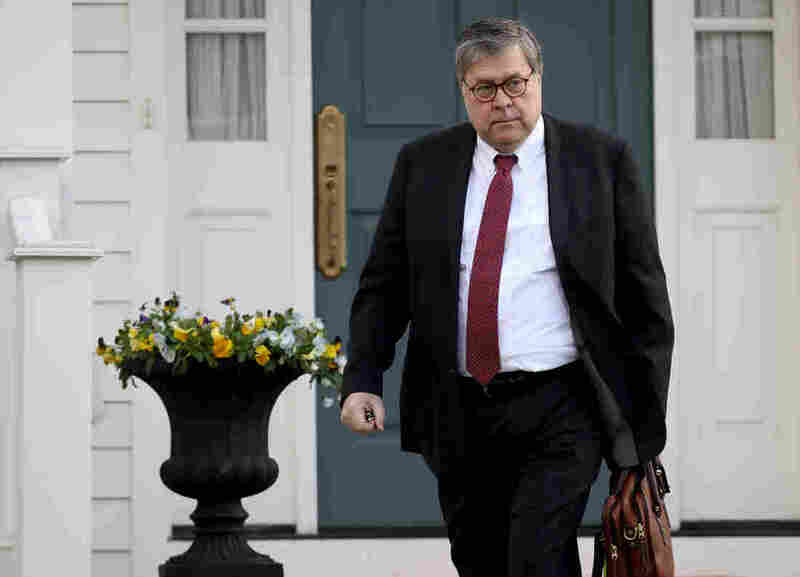 Attorney General William Barr leaves his home in McLean, Va., Friday before the Mueller report on Russian interference and potential Trump campaign collusion was handed over to him. After a 22-month investigation, the four-page letter is being viewed far differently by Democrats and Republicans, is almost certainly not the end of the story and will go down in political history. House Speaker Nancy Pelosi, D-Calif., has already set a very high bar for impeachment. "I'm not for impeachment," she told The Washington Post, adding, "Unless there's something so compelling and overwhelming and bipartisan, I don't think we should go down that path, because it divides the country." There's nothing in the Mueller report, according to the Barr letter, that meets those thresholds. If there was "something so compelling and overwhelming," Barr would almost certainly have had to have written about it. At best, Democrats will pull at the obstruction string, hoping for evidence in a fuller version of the report or underlying documents that help make that case. But at this point, there doesn't appear to be anything that will lead to "bipartisan" condemnation of Trump, though one could argue, very little would. The question is: Will the activist base of the Democratic Party, which already thinks the president should be impeached based on his actions and public conduct, accept moving on? President Trump speaks to reporters Sunday as he returns to the White House after spending the weekend in Florida. He reacted to special counsel Robert Mueller's concluded investigation. Trump and his supporters have been saying there was "no collusion" with Russia for two years. This letter adds momentum to Trump's argument. He and his supporters are celebrating it. The president described the investigation Sunday as "an illegal takedown that failed" (something Barr himself has said is not true) and noted, "Hopefully somebody looks at the other side." Whether that's real or just boastful talk is something to watch. Sen. Lindsey Graham, R-S.C., Senate Judiciary Committee chairman, tweeted, "The cloud hanging over President Trump has been removed by this report." And on Sunday, very quickly after Barr's letter went public, Trump's re-election campaign put out a video — meant to build a campaign text message list — touting there was no collusion. It's complete with buzzer sounds over various Democrats' faces who said there was evidence of it. Undoubtedly, until or unless something is released that contradicts Barr's letter, it does inoculate Trump politically to a degree. Special counsel Robert Mueller, and his wife Ann, leave St. John's Episcopal Church across from the White House Sunday. It should not be overlooked that Mueller made a point of noting in the report – and quoted in Barr's letter – that while he was leaving it to Barr to make the call on whether to charge Trump with obstruction, his report "does not exonerate him" on that question. That is quite the tease for Democrats, and they certainly want to pull at that string and find out more. Many Democrats have called on Barr to release more information, including the underlying documentation that led to the report. And while Barr's letter makes impeachment less likely, remember, House Judiciary Chairman Jerry Nadler, D-N.Y., who would shepherd an impeachment process, has said, "There can be crimes that are not impeachable offenses and impeachable offenses that are not crimes." After Barr's letter was released, Nadler called on Barr to testify because of "concerning discrepancies." So, clearly, the Democratic investigations won't stop. Democrats have launched investigations into a wide range of issues involving the president, from his campaign and administration to his business. Nadler has put out requests to 81 people in Trump's orbit, and House oversight committee Chairman Rep. Elijah Cummings, D-Md., sent 51 letters to the administration insisting on compliance with previous requests. And now that the Mueller probe has wrapped up, the focus will move to the investigation underway in the Southern District of New York that's already ensnared Michael Cohen, Trump's former personal attorney and fixer. That investigation could take a much more expansive view of Trump world, including the Trump Organization and the Trump inaugural committee instead of the narrow focus Mueller had on coordination or conspiracy with Russia and obstruction of justice. 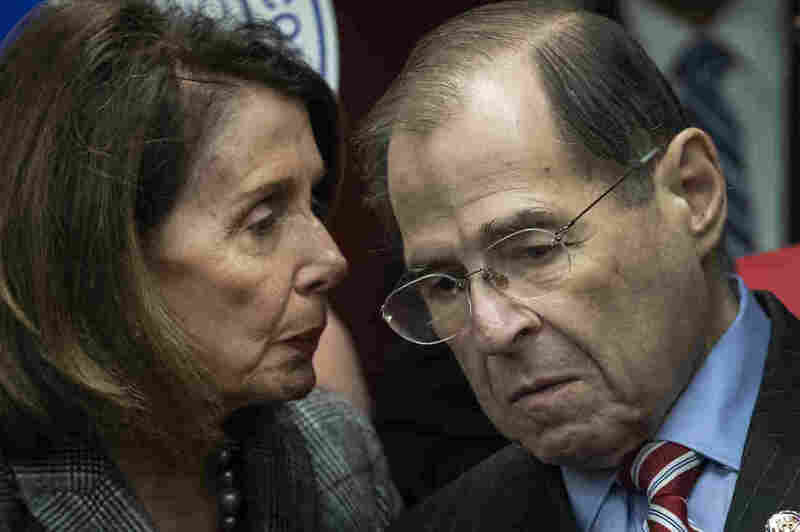 House Speaker Nancy Pelosi, D-Calif., speaks with House Judiciary Committee Chairman Rep. Jerrold Nadler of New York last week. The investigations will continue, but the Barr letter was undoubtedly a blow to Democrats. 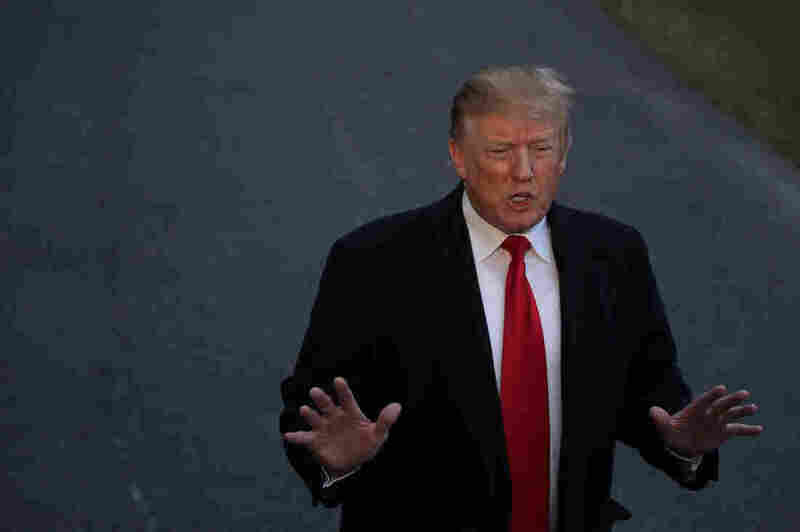 And while there are plenty of other avenues to ply when it comes to Trump, with the 2020 debates just a few months away, congressional Democrats and Democratic presidential candidates have to figure out what their focus will be. 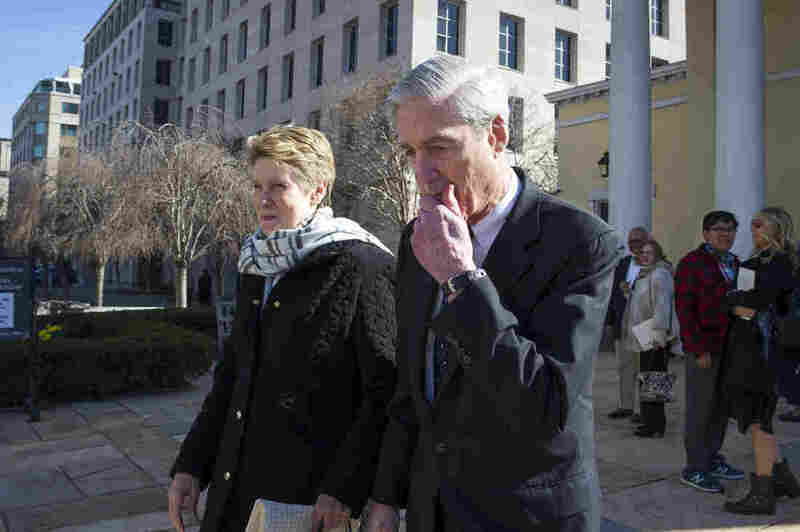 Polling has shown lots of support for a message of transparency – three-quarters said in a December NPR/PBS NewsHour/Marist survey that they want the Mueller report made public in its entirety. That included two-thirds of Republicans. So, as Republicans call for an end to the investigations, there is probably some merit to Democratic calls for more to be released. Still, many have taken a wait-and-see approach on whether they would back impeachment, depending on what evidence Mueller unearths, but many now have to be blowing out their Saint Robert Mueller Prayer Candles. Many of America's democratic institutions are facing stress tests. The president, for example, has criticized the judicial system ("Obama judges"), the intelligence community and FBI ("deep state") and, of course, the news media ("fake news"). And the response to the Barr letter shows more will likely have to be released if the Justice Department wants to be seen in a nonpartisan way like the military and law enforcement. "Given Mr. Barr's public record of bias against the Special Counsel's inquiry, he is not a neutral observer and is not in a position to make objective determinations about the report." That's a reference to a 19-page memo Barr wrote nine months ago to top Justice Department officials, arguing against Mueller being able to demand answers on the obstruction part of Mueller's investigation. That became a flashpoint during Barr's confirmation hearings — and is back, right in the middle of making sense of Mueller's findings. One potential consequence of all this is that it could wind up firing up Democrats even more for 2020. With impeachment looking less likely, Democrats will likely feel even more of a sense of urgency to get out every single vote to defeat Trump next year. They may be coming around to the realization that the only way to get Trump out of office is to rally together, go to the ballot box and just win.